At the school board meeting on Wednesday night, the administration said the offer from Architectural Innovations to do a more comprehensive demographics and feasibility analysis has been respectfully declined. The offer letter from Architectural Innovations can be viewed here. The administration’s explanation for declining the offer has been posted to the district’s website and is shown below. 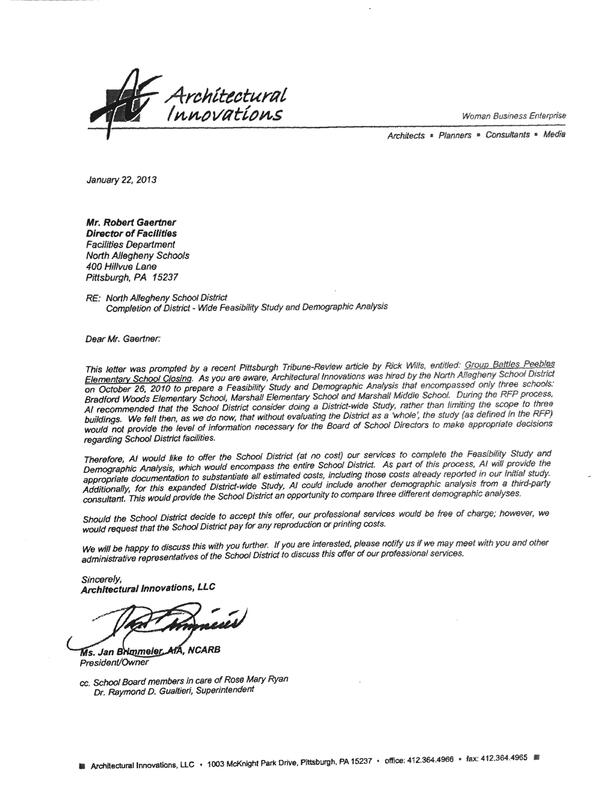 We understand a letter was submitted by Architectural Innovations to the North Allegheny School District in January 2013 in which they offered the School District free “services to complete the Feasibility Study and Demographic Analysis, which would encompass the entire School District…substantiate all estimated costs…could include another demographic analysis….” What is the North Allegheny School District’s intention relative to this offer of free services? The North Allegheny School District administration will not be engaging in any further work contracts for services related to the current Demographics and Feasibility Study at this time. This Study was originally initiated for three reasons: (1) to analyze the need for renovations and upgrades at Bradford Woods Elementary (BWE), Marshall Elementary (MES) and Marshall Middle (MMS) Schools; (2) to review building capacities; and (3) to provide a demographic study with a ten-year projection of student enrollment. Both the Architectural Innovations report presented in August 2011 (Phase I) and the Thomas & Williamson report (Phase II) presented in August 2012 provided detailed information relative to all three of these criteria. District administration also conducted its own detailed demographic study as a part of the research phase of this project. While the January letter received from Architectural Innovations inferred otherwise, District administrators recently verified with the firm that their original study did, in fact, provide a capacity analysis of all twelve schools – not just BWE, MES, and MMS. The District sees no need for the additional study, since all the relevant work offered in the January 2013 proposal was completed by this firm and reported on in August 2011. All the components of the Demographic and Feasibility Study – the Architectural Innovations report, the Thomas & Williamson report, the NASD research and data collection, and community input – are currently being used as a reference by the School Board as they decide whether or not to close Peebles Elementary School (PES). Information relative to secondary schools is not integral to that current concern. The existing information is adequate to support planning that may occur for re-districting at both the elementary and middle school levels. With regard to the similarities and differences between the Architectural Innovations report (Phase I) and the Thomas & Williamson report (Phase II), both consultants agreed that BWE, MES, and MMS require renovations and upgrades. However, the two reports offer plans that recommend different timelines and different budgetary objectives. Those timelines and budgetary objectives influenced the recommendations of each consultant. Based upon their findings, the Architectural Innovations report presented more than a dozen recommendations, in response to their identification of over-capacity at the elementary level. The top three recommendations included (1) doing nothing but extensive renovations at BWE, MES and MMS; or (2) closing BWE and doing renovations/upgrades; or (3) closing BWE and PES and doing renovations/upgrades. Thomas & Williamson presented three options for consideration by the District, based upon their identification of over-capacity at the elementary level. Their recommended option was that of closing PES. The demographic studies from both reports come to the same conclusions relative to elementary student enrollment over the next ten years. Stable to slightly declining enrollment was projected by both. This information also coincides with the yearly study done by the District administration and the annual work that occurs in support of District enrollment and staffing projections. As such, Architectural Innovations has been informed that the District is satisfied at this point in time with the sum total of the research and data that has been gathered in support of this project. The scope of their report was complete as submitted. While they offered to retain another demographer at no charge, the conclusions of the original demographer who conducted the study for Architectural Innovations have been verified over the course of the last year and half by two other sources. It is worth noting that, after Architectural Innovations presented their August 2011 report, the Board requested the Phase II study. The administration issued an RFP detailing the additional work required. Architectural Innovations responded to the Phase II RFP. The quote they submitted was two times higher than the cost of their Phase I study. The District could not justify paying that amount of money for the scope of work in the Phase II study. In negotiations, the District reduced the scope of the RFP and asked Architectural Innovations for another bid. Their quote was still more than 30% higher than the cost of the Phase I work. Ultimately, Thomas & Williamson was selected to do the full scope of work originally requested in the Phase II study. Architectural Innovations, the consulting firm that prepared the Phase 1 report, sent a letter to the district offering to complete a more comprehensive demographic and feasibility study free of charge. The firm presented their initial findings to the district in August 2011. This is a huge development for the hundreds of residents that have been urging the administration to do more due diligence. You can read the entire letter by reading below or clicking here. The question now is: What will the district do with this offer? Come to the school board meeting at 7pm on Wednesday, February 20th and encourage the board to take a step back and gather more evidence before moving forward with a measure as drastic as closing a building. The district’s ability to close a small elementary school is contingent on a decline in student enrollment, which relies on projections prepared by the administration, as well as those contained in the Phase 2 report. The 5-year enrollment projections prepared by the administration have consistently understated actual enrollment for the past 13 years. This review of the 5-year forecasts in the years 1999, 2006, 2007, 2008, and 2009 demonstrates that there is consistent evidence of the administration underestimating enrollment by an average of 353 students. Given this trend, it is reasonable to assume that 2018/2019 enrollment would be 8585 and not the projected 8101 students noted in the most recent 5-year forecast. If one-third of this increase is attributable to elementary school students, the district will exceed the target capacity of 3,720 students established by the administration. The graph below breaks elementary enrollment out of the total enrollment forecast and compares actual to projected enrollment for 2011/12 and 2012/13. The enrollment projections contained in the Phase 2 report are even lower than the forecasts prepared by the administration. If it is acknowledged that the administration has consistently underestimated school enrollment since 1999, it is of considerable concern that the elementary enrollment forecasts set forth in the Phase 2 report are even lower than the administration’s elementary enrollment forecasts for the period 2014-2021. For example, the Phase 2 report projected an elementary enrollment of 3278 students for 2015/2016; this was the number used in the administration’s October 24 presentation. However, in the November 14 presentation, the administration provided its own forecast of 3401 students for 2015/2016. Given that the school board minutes over the past 13 years reflect that the board has been concerned with the administration underestimating enrollment, it is of great concern that forecasts contained in the Phase 2 report fall even further below the administration’s projections for the years 2014-2021. If these forecasts are acceptable, it would appear that North Allegheny is preparing for a significant and unprecedented decline in its student population despite evidence of new housing starts and continued migration into the district. I am a father of four children who attend North Allegheny School District. We chose NA because of its reputation as providing a quality education. I am a proponent of reducing costs within the district and originally supported the concept of closing an elementary school. I read the news story “Community group questions North Allegheny enrollment projections” (Dec. 6 and TribLIVE.com). Afterward, I read the Save NA Schools group‘s report mentioned in the story and realized that I made a mistake in trusting the district‘s administrators to make a sound decision. First, closing a small elementary school (one of 12 total schools) in a district with a $127 million budget should save more like $5 million a year than $850,000 a year. Second, it is clear that at a minimum, the district should re-evaluate its data and analyze this plan again. Finally, what is really driving the deficit problem? Teachers‘ pensions. The administration needs to address that problem with something other than cannibalizing schools, reassigning hundreds of students to different buildings and overcrowding classrooms for a pittance that will not solve the deficit problem. With the North Allegheny School Board poised to take public comment on whether to close Peebles Elementary School, opponents are galvanizing to prevent it. A group of parents and taxpayers calling themselves “Save NA Schools” are flooding the district‘s website, sending emails to the media, residents and school board members, and turning up at board meetings to protest any attempt to close Peebles. They say a consultant‘s report recommending the closure ignores the fact that Bradford Woods Elementary needs $14 million of repairs, while Peebles does not. Many group members are opposed to closing any schools. “At the end of the day, what the board says does just not add up. Their actions with the school closings make no sense,” said Daneen Leya of McCandless, a mother of students in the district and a member of Save NA Schools. Raymond Gualtieri, North Allegheny‘s superintendent, recommended closing Peebles to save $850,000. The district faces a $10 million deficit for the 2013-14 school year, he warned in November. Yet a consultant‘s report says it would be more economical to close Bradford Woods. School board president Maureen Grosheider questions estimates in the report of the cost to repair Bradford Woods. The study is one of two commissioned by district. The second recommends closing Peebles. “After the first study, the numbers for renovations just seemed excessive. The question became, ‘Are those numbers really real?‘ ” Grosheider said. The board will hold the public hearing on Peebles on Jan. 30. A time and location have not been set. A board vote could come within 90 days of the hearing. Ralph Pagone, one of two board members who voted last month against having a hearing, said the district is rushing the process. “We are moving too fast. There are conflicting studies. The board did not like the first study and got a study that told them what they wanted to hear. They do not seem to be paying much attention to the public,” Pagone said. The initial report from Architectural Innovation of Ross recommended closing Bradford Woods and keeping Peebles open. The board‘s majority favors a study by Jon Thomas of Thomas & Williamson construction consulting firm, also of Ross, which recommends closing Peebles. James Construction Co. sued Thomas & Williamson and the school district over renovation work at North Allegheny in the late 1990s. James won damages of $524,087 from the district in Allegheny County Common Pleas Court. “The fact that the district had a recommendation from 12 experts to close a school with $14 million in repairs and commissioned a ‘second opinion‘ from Jon Thomas is very suspect. Especially when you consider Mr. Thomas recommended closing a school with no repair costs and Judge (Timothy P.) O‘Reilly concluded he acted in ‘bad faith‘ the last time he served as a consultant for North Allegheny. This all begs the question: What was the real motivation in hiring Mr. Thomas?” said Tara Fisher, a parent of a Peebles student. Jon Thomas could not be reached on Wednesday. Grosheider said Thomas has a record of success with the district. If the population of the smaller schools are considered in reference to this capacity, then the schools are working– or, in fact, exceeding their target capacity. MES-100+ %The latest recommendation by the administration moves to a new elementary school model based on 30 students in a classroom for grades 3 through 5 with a target capacity of 90% for each elementary school building instead of 82%. This means loading elementary school buildings to 540 students instead of 450 students, which “creates” additional capacity and leads to perceived “excess” capacity in some buildings. Further, the building capacity numbers that the administration is targeting are a best guess scenario and do not take into account building specifics. The elementary buildings across the district are not one-size fits all- and important programs will be lost to the reconfiguration of elementary schools. The presentation Dr. Miller presented to the North Allegheny School board on October 24th assumed target building capacities of 540 for every elementary school except McKnight and Marshall. This is inconsistent with both the Phase 1 and Phase 2 studies, which listed individual target capacities for each elementary school building. For example, in the Phase 2 report, NASD target capacity for BWE was listed at 600 students, FES was listed as 595 students and PES was listed at 520 students. But in the presentation made by Dr. Brian Miller at the October 24th board meeting, excess capacity was calculated using 540 for all three buildings. Changing the denominator in these calculations has a huge impact on the excess capacity percentages that are being presented to the community and can be very misleading.